The festive season is around the corner and everyone is much excited to decorate their homes. The easiest way to revamp any room is to change the furnishing. You can use new curtains, cushion covers, poufs, rugs and bedspreads in bright festive hues. Metallic colors are much in trend these days. For example, Gold, being a metallic shade can brighten up any space. If not gold then you can opt for some shiny and velvet fabrics to brighten up your space. The festive season is a time of all shiny and bright things so we should always add something that will brighten up our space. A festive furnishing ranges from cushions, rugs, poufs to couches, sofas, statues and many others. Grand lighting such as this charming chandelier hanging from the ceiling together with the ones on the walls creates a festive ambiance in the living room. The elegant chandeliers light up the whole living room with an air of sophistication and celebration. Another simple yet effective way of decorating the house is to throw in a few colorful cushions in. This will add a splash of color to liven up the house and set a cheerful mood for the occasion. You can also add antique items to your home décor which will create a great ambiance to any home décor. Gold, being a metallic shade, can brighten up any space. However, it is important to use the color judiciously so as to not overpower the theme. Using gold as an additional element in an already existing color scheme will give that right amount of glitter without making space look too jazzy. Velvet sofas in neutral crème shades are accessorized with embroidered cushions will definitely glitter up any space. A chic Home Couture table with sleek gold legs and a simple white top adds a modern touch to your interior. Natural fibers like cotton and linen are considered to be a preferable choice for soft furnishings. Window treatments play an integral part in enhancing the grace and look of ones’ interior. A heavy cotton fabric holds its shape beautifully and firmly further giving a phenomenal finishing touch to the interiors. On the other hand for wall coverings, woven fabrics are highly recommended which are designed with great care expertise to perfectly compliment every space and décor. These days eco-friendly wall coverings made up of natural palms, bamboo, grasses and paper weaves in grass cloth are also being preferred which have the unique design and look, further giving a classy and elegant appeal to the interiors. 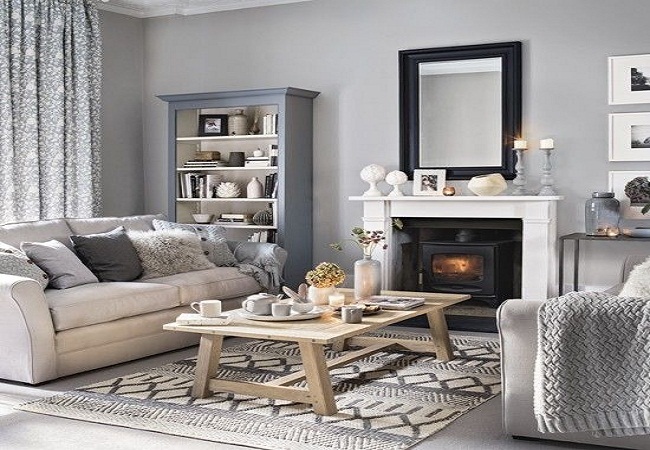 It is very important to make a correct choice of fabric while selecting textures and patterns for the walls, curtains, upholstery and other soft furnishings. While selecting fabrics for festive purpose in soft furnishings synthetic fibers like nylon and polyester are easy to maintain, also cotton is used extensively for soft furnishings and upholstery as this particular fabric is comfortable, durable and look pleasant. Texture plays a very important role; damask a self-colored satiny fabric with woven floral designs gives a promising and alluring look to the curtains. One should look for fabrics which are easy to maintain, comfortable, soothes the ambiance and are durable for a long run.